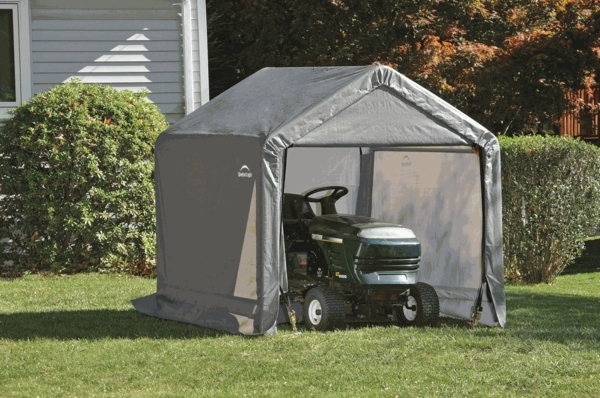 Have you shelter up and operating in no time with this Shed In A Box Peak-Style Portable Storage Shed with Gray Cover. The shed in a box is made by ShelterLogic, the premier manufacturer of portable and temporary shelters, garages and sheds. The shed in a box has a fitted gray cover that is triple layer heat bonded polyethylene. The cover is waterproof. The cover is treated for UV rays to protect from the damaging rays of the sun. It is also treated with fade blockers and anti-mold agents. How much snow can it take? Are there dual doors available? No, there are not. That unit only has the zipped door on one end. Can the side panels be removed, leaving it open from the front and sides ??? The top and sides on this unit is one solid piece, so that would not be an option unfortunately. Thank you for your inquiry. Can firewood be stored inside this ShelterLogic Shed-In-a-Box Peak-Style portable storage shed? 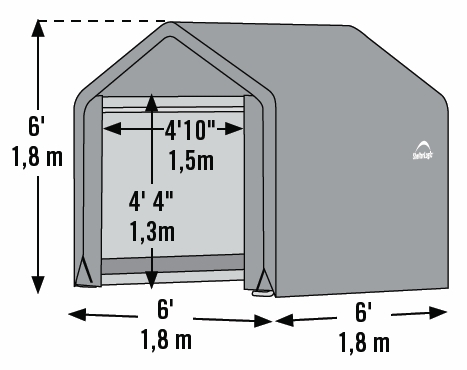 While firewood could be kept in this shelter, please bear in mind that it does not have a floor, so you would want to keep the wood elevated or use a tarp to keep the firewood dry if it will be laid directly on the ground. Does this have a door that closes? Yes. This has a door. The photo shows the door rolled up out of the way. Somewhat easy to put up. While the instructions said to use two people I managed to do it by myself. This temporary garden shed, our intended use for the tent, is much sturdier than we expected. easy to assemble, straight forward instructions, well organised parts. its a lot more than we expected and I would recommend this shed to others and I will purchase other temporary shelters from this company. Great price too! The finished product is exactly how we thought it would be. Assembly instruction could be a little more user friendly, but we figured it out. This was sometimes frustrating to put together because the supports came apart easily until it was covered with the tarp. I was pleased that there pieces enclosed to anchor it to the ground. When complete, it seemed very sturdy. The Shed-In-A-Box was an excellent heavy duty quality, better then expected. Directions were easy to follow and the assembly did not take long. The frame is very rugged and the tarp is quite heavy duty. It has been through two big snow storms and still in great shape. ProsHeavy duty frame. Thick rugged vinyl. Good directions. Easy assembly. Fair price. ConsOne section of the frame was slightly bent. A little more involved than I expected to put together but not too bad. ProsKeeps my garden tractor out of the weather without any construction. ConsReally was looking for a 6 x 8 x 6, a little smaller than I wanted.